These printers are the best to refill! No tools, required at all! Just follow our photo illustrated guide included with purchase. Refill to save over $100.00 on each color cartridge! The Starter Toner Cartridges do not have a built in toner detection mechanism as the standard replacement consumable toner cartridges. This will cause the "Order Toner" message to remain, even after refilling of the starter cartridges. 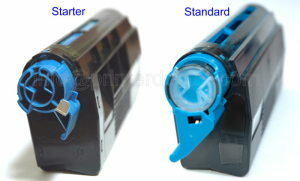 We provide reset guide, please order it here, if you are going to refill starter cartridges. You can add any number of any color bottles to shopping card. These printers are the best to refill! No tools, required at all! Just fallow our photo illustrated guide included with purchse.